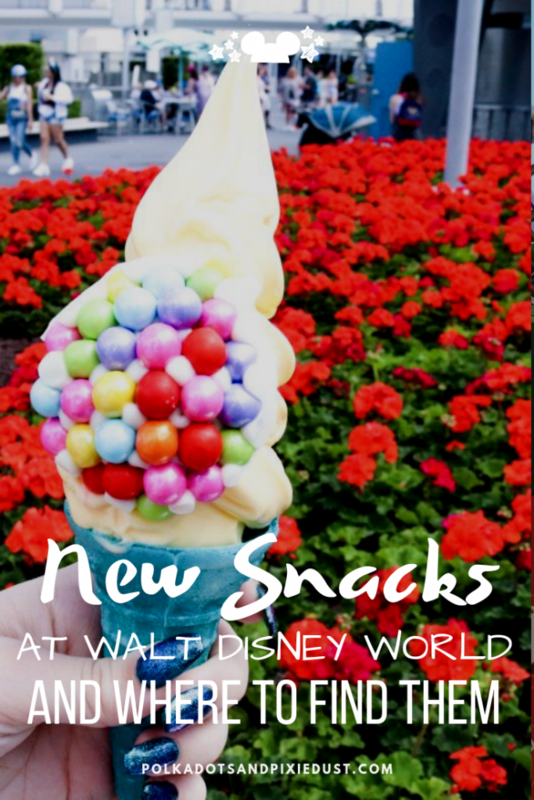 Spring has officially arrived at Walt Disney World, and apparently that means new snacks! With new snacks popping up all over, we are here to help you see what’s new and where you can find it. Here’s all our favorite New Snacks at Walt Disney World you can find in the parks for 2019. So let’s get to snacking! The new Hei Hei Cone can be found at Aloha Aisle in Adventureland (the same place you get dole whip) and is actually two kinds of dole whip in one! 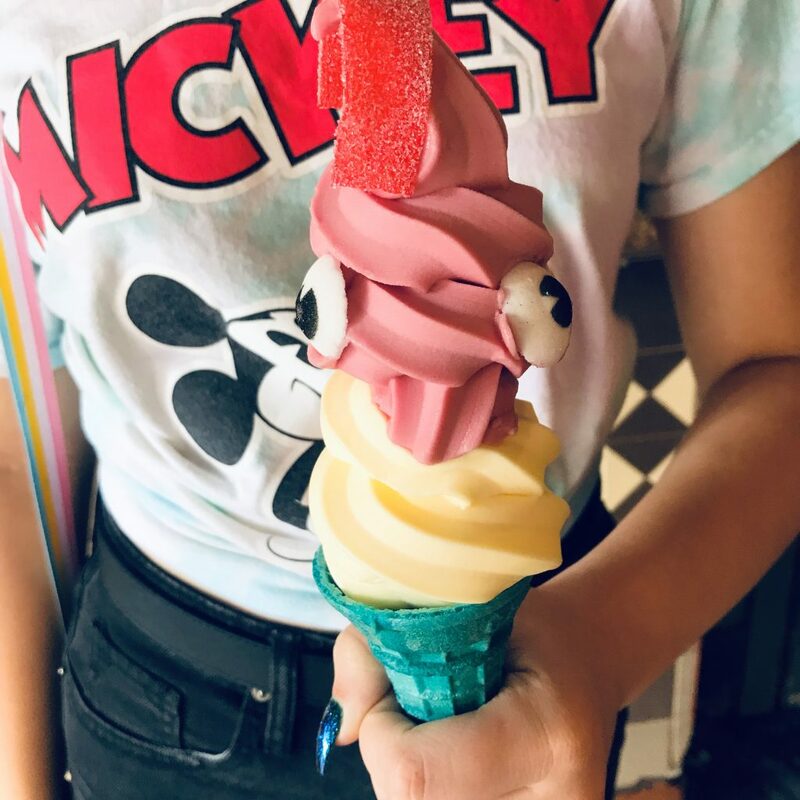 Raspberry Dole Whip on the top half, Pineapple Dole Whip on the bottom, a sour candy strip on top and two candy eyes all on a blue sugar cone make this treat completely Instagrammable and delicious. 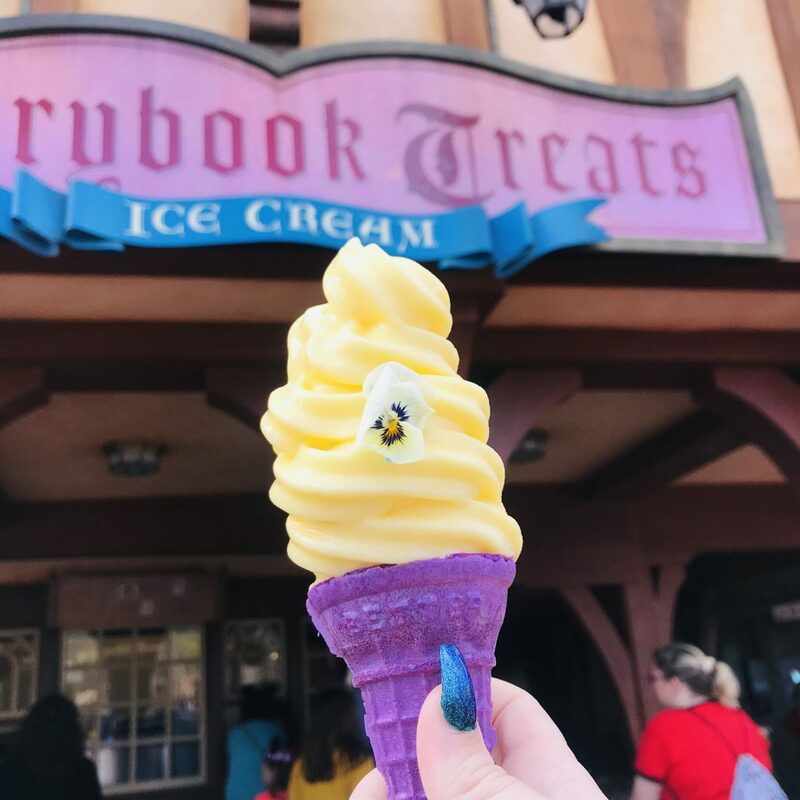 Finally Rapunzel getting some of the love she deserves, this lemon soft serve is pure Tangled magic! Served in a purple sugar cone, with edible flowers, your next Instagram picture is just waiting to be had, if you can take a pic before devouring this delicious lemon concoction. Adventure is out there! 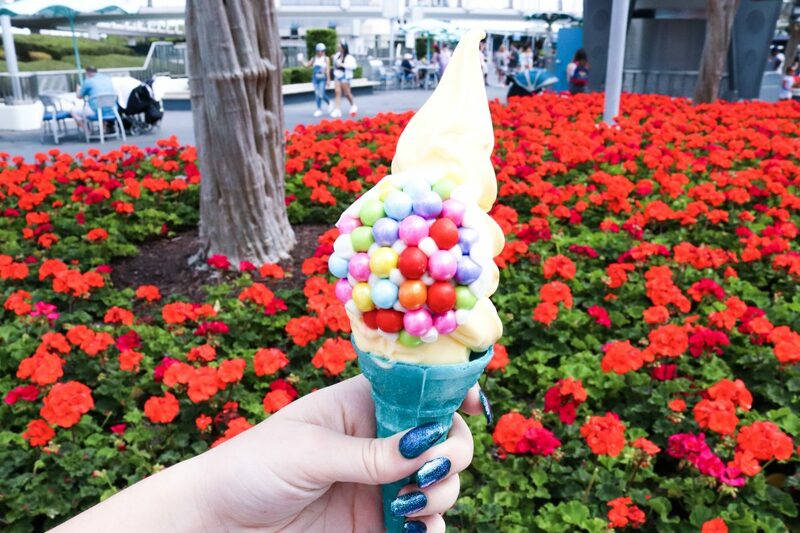 So be sure to fuel it with this Mango Dole Whip cone inspired by our favorite adventurers from Up! This is served in a blue sugar cone and topped with mini chocolate balloons, which are held together by white chocolate. We personally skipped the candy topper, for fear of going into a sugar coma, but the cone itself is super delicious! 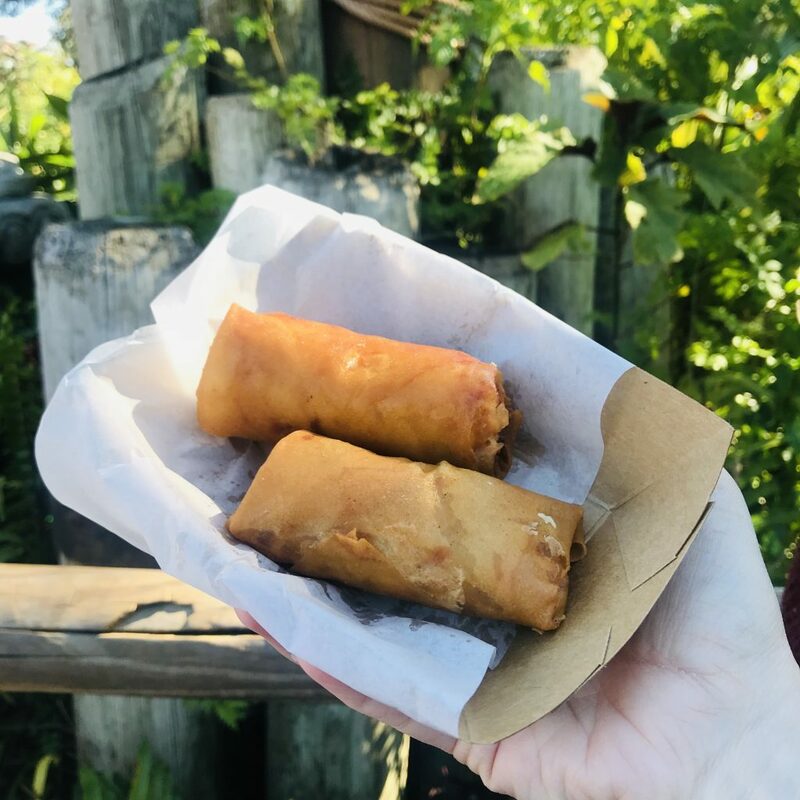 You guys know we love the cheeseburger spring rolls in Adventureland! They occasionally bring our new flavors from time to time at this little cart and the newest flavor is philly cheesesteak. A little better than the Buffalo Chicken variety, but still not quite as good as the cheeseburger rolls, these are a great snack if you’re over all the sweetness of a lot of the Disney snacks. Along with the new Dumbo sipper and Casey Jr. popcorn bucket, comes a slew of new treats at Storybook Circus. From a pretty spectacular popcorn bucket candy apple to Dumbo shaped cookies, Big Top Treats also has Timothy and Dumbo themed cupcakes complete with feather and peanut accents perfect for your next trip to the circus. Grab a Briar Rose Gold Minnie Rice Krispie Treat or the Briar Rose Gold Caramel Apple for an extra special snack in honor of our favorite sleepy princess. You can also find a simpler Briar Rose Gold Chocolate Covered Strawberry or Cake Pop at the Main Street Confectionery for a quick taste of this spring trend. This is actually one we skipped because, well, every credible source we found said to pass on this. Even if we hadn’t relied on their tastebuds to make this decision for us, at $6.59 for a pretzel in dipped in Marshmallow Fluff, it better be good. And honestly, it just sounded odd to us. But if you really want a pretty Instagram pic, or if you are really curious about this new snack, or maybe if you just really love marshmallow fluff, it can be found at Tortuga Tavern in Adventureland. This cinnamon whoopie pie with graham cracker frosting is a princess’s dream! Topped with a chocolate frog prince, this can be found in Liberty Square near Columbia Harbour House. This sundae not only comes in an adorable little polka dot container, but its also loaded with goodness. Two scoops ice cream, topped with chocolate sauce, whipped cream, strawberries, oreos for ears of course, and a chocolate Minnie chocolate bow, this sundae is adorable and delicious. Can you really ever have enough ice cream options? We bet the folks at the Plaza Ice Cream Parlor would say no. 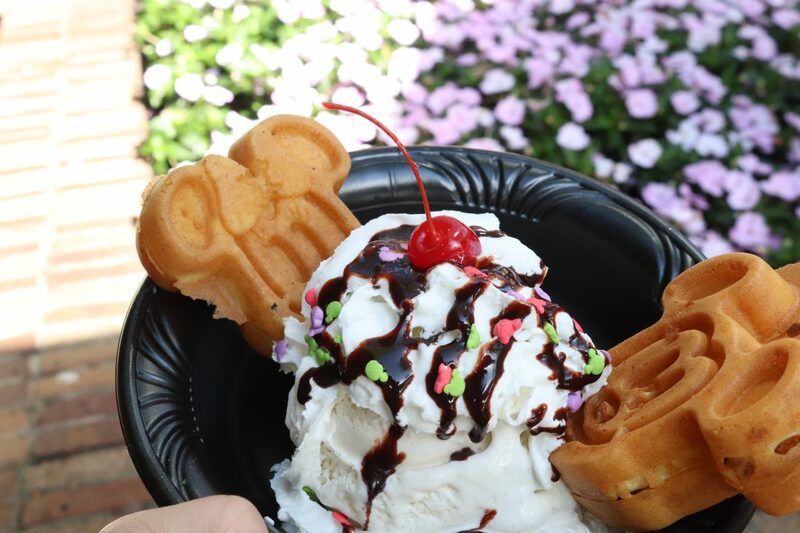 So, they’re serving up another fun and delicious sundae perfectly suited for Mickey and Minnie’s 90th celebration. 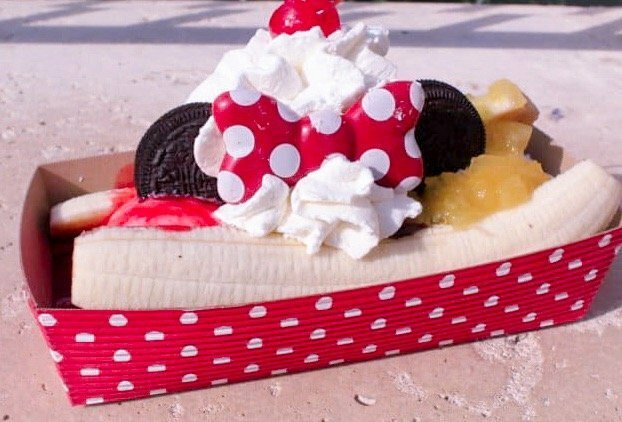 Also coming served in a polka dotted tub, this is a banana split with 3 scoops of ice cream, strawberry and pineapple sauces, hot fudge, Oreos again for ears(its always a winner) and a Minnie chocolate bow. Mickey as a chocolate whoopie pie and Minnie as red velvet, both filled with cream cheese frosting and decorated accordingly. These can be found at Columbia Harbour House and are really just your standard whoopie pies dressed up to be a little cuter. Grab this giant layered treat at the Lotus House, in China at Epcot. It may just look like rainbow-colored floss, but actually honors a Chinese street food tradition of twirling layers of colored cotton candy to create art. This Spring Fantasy Cotton Candy Treat is available through the summer, so grab it while you can. Debuted in February, we always love seeing a good snack come to Animal Kingdom. 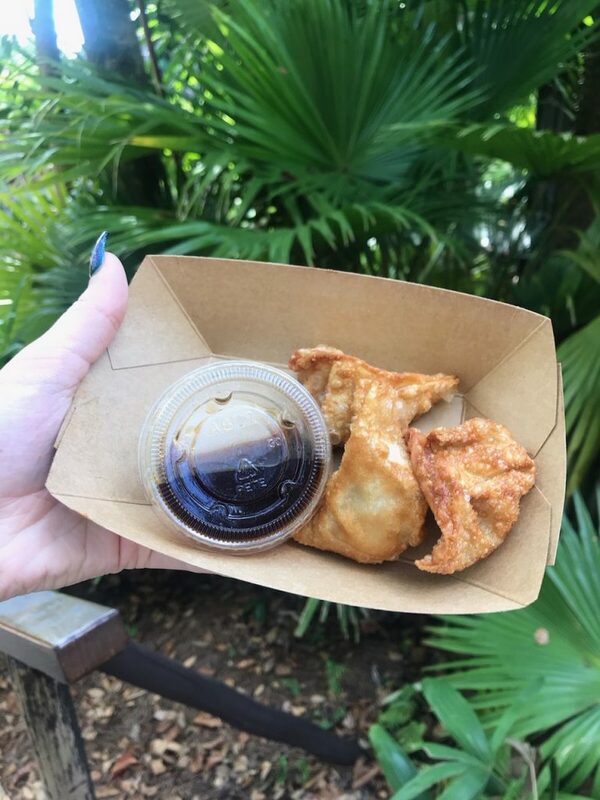 These chicken dumplings are delicious, crunchy and can be enjoyed with a beautiful view of the Tree of Life. Found at Mr. Kamal’s in Asia, we love these chicken dumplings as a not so sweet snack for those mid day hunger strikes. If you guys have read our top animal kingdom snacks, then you may know that we love the pastries at this Park. Their newest is a Danish pastry twist filled with mini chocolate chips and covered in white and dark chocolate drizzle. This can be found at Isle of Java in Discovery Island. 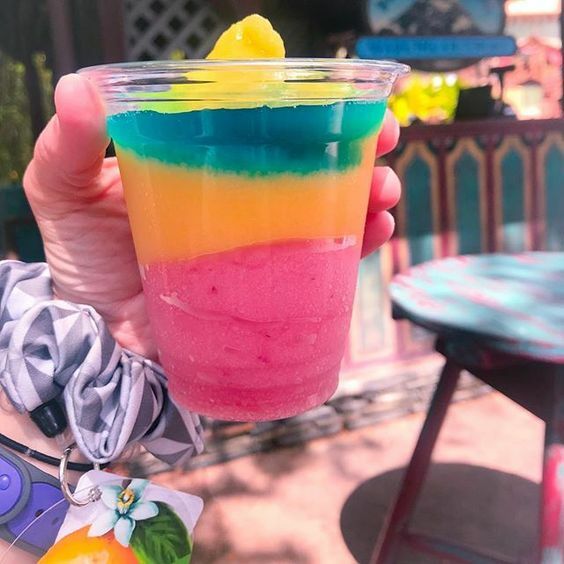 Located at Warung Outpost in Asia, Animal Kingdom, these UP inspired treats combine a rainbow of colors! The Himalayan Cocktail is a swirl of Strawberry and Mango Maragarita with Blue Curacao. The resorts at Walt Disney World have really been stepping up their snack game lately! We are always on the hunt for more snacks you can get outside of the Parks, so we will definitely keep these updated as they starte arriving. 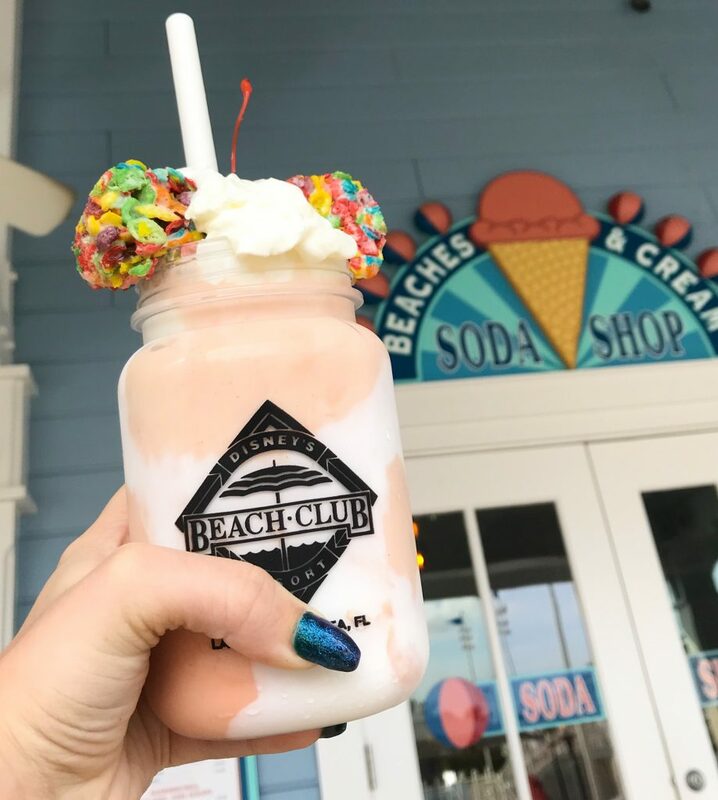 While this isn’t technically at a resort, it is from Beaches and Cream at The Beach Club so we think it kinda is…..
A huge Creamsicle milkshake topped with fruity pebble krispy treats for ears, whipped cream and a cherry, this milkshake is delicious and HUGE. Definitely shareable, this milkshake comes in a souvenir cup and can be taken to go. 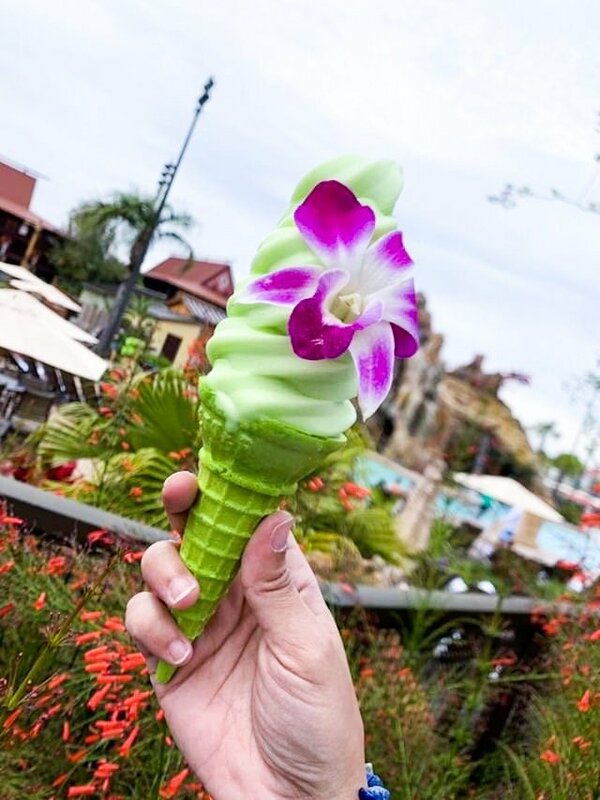 Lime Dole Whip fills a green sugar cone and is topped with a beautiful tropical flower. Light, citrus-y and refreshing, this cone is sure to transport you to a beautiful tropical escape. We highly recommend enjoying this on the beautiful beaches of The Polynesian for the full effect. Who doesn’t love a good s’mores?! Well now you can have it in a cookie! Filled with gooey marshmallow fluff and graham cracker crumbs, topped off with chocolate drizzle, this new snack just skyrocketed to the top of our must try list. Looks like we will be visiting Pop Century soon…. Decorated in spring colors these assorted mini donuts come in little packs of 4, and options may vary! We love that you may not know what you get, but rest assured just like the Big ‘Ol Donuts they will be delicious. Versions with cap ‘n crunch toppings, chocolate pieces and sprinkles have been spotted. Have you tried any of the new snacks? Tell us which are your favorites! Check out all our snacks posts! Do you know if these new snacks will be part of the Disney dining Plan snack credits? I was lucky enough to get the chance to try the Philly cheesesteak spring rolls, yum! !